Greg is at the forefront of the movement that is finally adding a contemporary urban sensibility into the visual arts in New Zealand. “It’s a real challenge with kiwiana though, because everyone has had a stab at it,” he told Kiaora's Philp “You have to find ways to put a new twist on it and keep it contemporary. That might mean breaking the thing down into geometric shapes and using bold colours." Straight graduated from the University of Auckland's Elam School of Fine Arts majoring in print making. A fine art printmaker who also works as a T-shirt graphic designer for streetwear brands such as Huffer and Federation Straight's artwork is an exciting melding of high art with NZ pop culture. 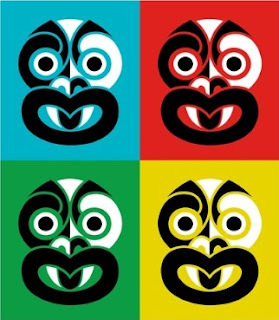 We are cataloguing Straight's first series of prints including "Pop Art Tiki" shown here and Greg Straight's prints wholeheartedly get NZ Fine Prints' "buy" recommendation for astute collectors building their hoard of contemporary NZ editions.